Trump tears into Bill Nelson. Gov. Rick Scott skipped the rally in Tampa, but President Donald Trump gave him a warm embrace and tore into Democratic rival Sen. Bill Nelson as as a puppet of Chuck Schumer and Nancy Pelosi. "And the new star of the Democrat party, Maxine Waters," Trump said as the crowd roared with boos. "You know I live a lot of time in Florida. The only time I see Bill Nelson is five months before every election. And after a while, you forget, who's the senator," Trump said, of Nelson's relatively low name ID despite decades in office. "We have to be careful," Trump warned. "We have to make sure that Rick Scott wins and wins big." Scott and Nelson are locked in a tight battle, polls show, despite Scott far outspending the Democrat on TV. But those polls give Scott the edge in a state that reliably delivers close elections. Trump kept going, noting Nelson voted for Obamacare (and the president took a dig at "one gentleman" Sen. John McCain for voting against repeal) and voted against against the tax cut. Trump asserted that Nelson put "criminal aliens" before Americans because he joined Democrats in blocking sanctuary city legislation and Kate's Law, named for an American woman shot by an illegal immigrant. Nelson sought to turn the tables. Scott did attend a workforce development event at Tampa Bay Technical High School, and Trump lavished him with praise. "It's great to be back in Florida. I love Florida. 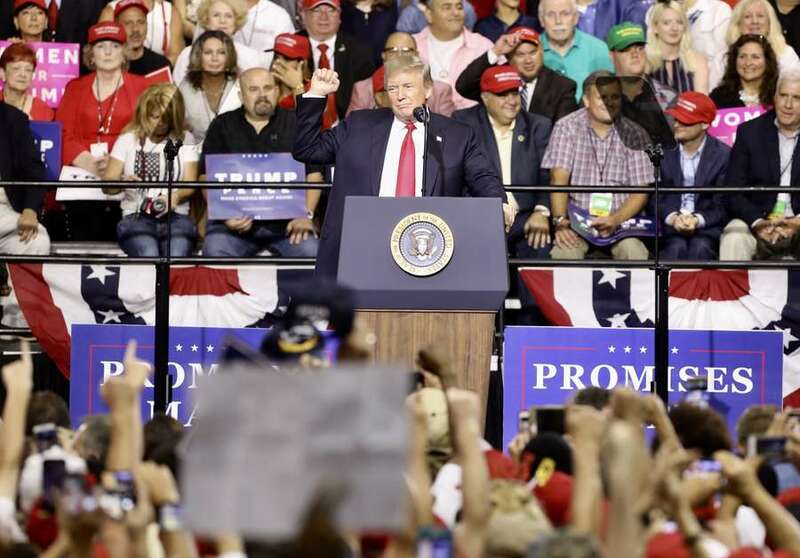 We had a great victory in Florida, and we're going to have a lot of great victories in Florida in the coming short period of time," Trump said to applause. "And we're honored to be joined — speaking of victory — by your tremendous governor. He's a tremendous guy. He's a friend of mine for a long time. He works really hard. He's really smart and get he gets it. And he loves this state, he loves this country — Rick Scott. (Applause.) Fantastic. Rick has been a true leader in expanding access to demand-driven skills training, helping countless Floridians find steady jobs and rewarding their careers. And he loves doing it."